After Party Upholstery cleaning is necessary to the utmost because of the wear and tear it goes through are one of those very few articles present in our house which deserves proper care. The elegance and look of the interiors improve significantly by adding stylish upholstery. It not only makes our house look great but also showcases our choice. It is a reflection of the level of sophistication in our living thoughts. Irrespective of our busy schedule or immense work pressure, we need to take out some time to take care of our home. We generally take various measures to prevent or restrict activities of our kids or family members to ensure safety. We usually make sure that our upholstery stays in best shape. Besides being costly, these articles are very much delicate on the surface. They can easily get scratches, bruises, spots, and stains which can simply ruin the overall show of the thing. It can give the room dull aura and also make you feel low. We go out of our way to be careful regarding the safety of our upholsteries from any sort of threats which can affect their hygiene and look. Similarly, we should also take some measures immediately after an event or party in our house. Gathering of guests, relatives, friends especially in some formal occasion or party can surely cause damage to upholstery. So once you are done with your function, gathering, meet or party you should follow the following few steps to keep your upholstery intact from the wine spills and gravy stains. 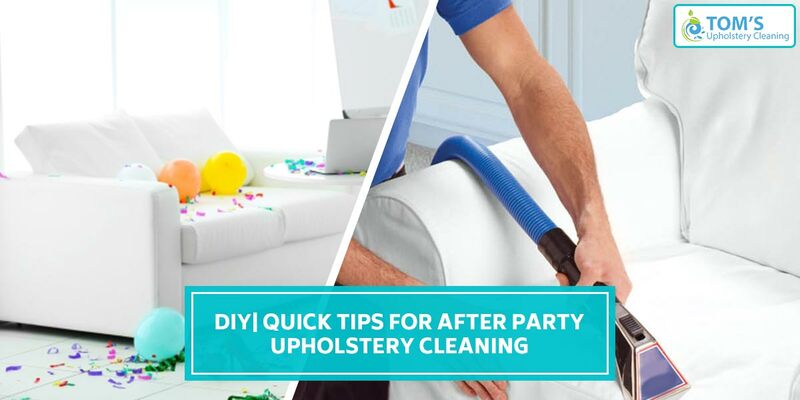 Here are the things can quickly do for after party upholstery cleaning! Run your hands into the niches of your furniture for loose food crumbs, dust, dirt, spills, and droppings. Use a glove to frisk. Use your vacuum cleaner to remove all loose dust, dirt, food crumbs, pieces, and droppings. After detecting the position and amount of dirt, remove the marks and stains first by using your upholstery cleaner or any home-made cleaner. The marks and stains could be of alcoholic or non-alcoholic nature, they could also be creamy or semi-solid food items, sauces, and jellies etc. After completing the cleaning task, ensure that there is no excessive moisture on the surface of the sofa, couch upholstery. Because wetness can directly result in erosion or rust or brittleness on the surface of your lovely belongings. Use upholstery and crevice attachments along with your vacuum cleaner. Give a thorough cleanup to all nooks and corners. Give special attention to all the grooves, curves and unreachable portions of the upholsteries. Hidden particles can accumulate and result in corrosion of surface inside the upholsteries resulting in wear and tear and bad smell. Take the help of professionals: Upholstery cleaning can be a bit of a stressful task wasting a lot of time and energy. It is very difficult to get rid of such stains from sofa upholstery. Even if that is possible to some extent, it can leave your upholstery looking discolored and faded. Thus it becomes important to take the help of expert couch cleaning professionals to retain the original nature of your valuable furniture. Experts know exactly what kind of treatment is required to make the upholstery shine like new. They have experience and know how related to all kinds of cleaning services.